We woke up on the early morning and we´ve had an silent night on some really comfortable mattresses. The moring sunbeams can through our small window and we had to expect perfect conditions for our second day. After we´d visited the bathroom we packed our backpacks and stepped out in front of the Kreuzeckhaus. The sun was waiting for us and we had simple breakfast out of our backpacks. The moring sun was fighting against the last fog and we had an clear view down on Garmisch Partenkirchen. After our breakfast we started our trek. Our stage for today was only 4 hours of Walking distance and our goal for today was the Reintalangerhütte next to the mountain river Partnach. So we started to walk slowly. We would have enough time. The signage of the trek was really good and we walked in the warm moring sun until we reached a part where the trail was closed because of some construction works. We had to walk around and followed the signs. The signs led us uphill and after a while we had a great view back on the Kreuzeckhaus. The the other direction you normally can see the Zugspitze but the fog was covering the peak. After a short whilewe reached the Hochalm. We couldn´t see some more signs and tried to follow the GPS track on our phone. It was 30 minutes later when we noticed we are on the wrong trail. We had to decide. Trun around or walk down under a closed ski lift. We decided to walk down and it was really steep. We had to use our butts from time to time and after 15-20 mwhere back on the main route. An exhausting but very funny part of our trek. The lunch break was over and we walked in direction Reintalangerhütte. Our trails was right next to the Partnach. The Partnach is an 18 km long Bavarian mountain river. 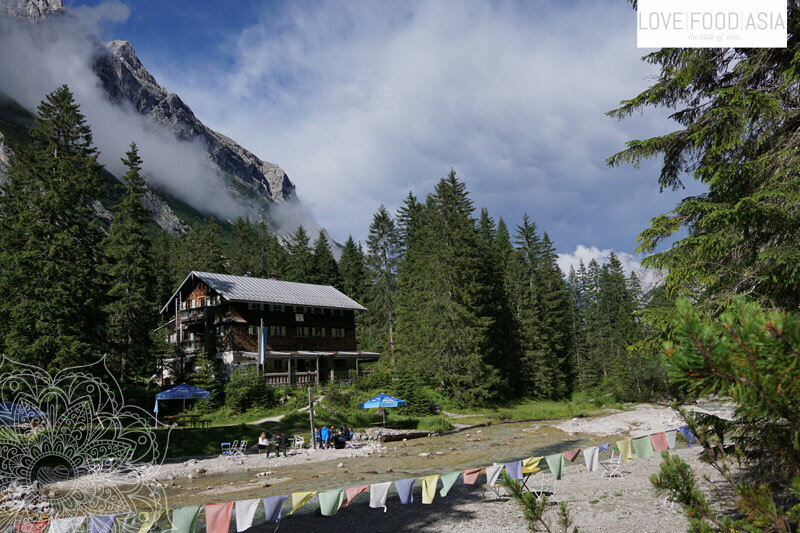 It rises at a height of 1,440 m on the Zugspitze Massif. The Partnach is fed by meltwaters from the Schneeferner glacier some 1100 m higher up. There was not much slope on the trail and we met some mountain bikers and hikers on a day trip during our last part. On the afternoon we arrived at the Reintalangerhütte. A DAV lodge that is built near a very nice place next to the Partnach. There is a gravel bank where you can sit on some chairs and so we did. Between the trees some prayer flags are waving in the wind and we thought about our trekking tour in Nepal. We enjoyed our stay in the warm afternoon sun next to the river and had two more beers with a nice river sound in the background. A perfect outcome of our second day. The tenant of the Reintalangerhütte has an international Team and could hear two Argentines and one Bavarian making music together after dinner (Off course we had another mountaineer meal) After an evening full of handmade music and good conversations we went to the camp. The mattresses where really small and we had lack that one mattress was free next to us. So we had much more space than the others during the night.